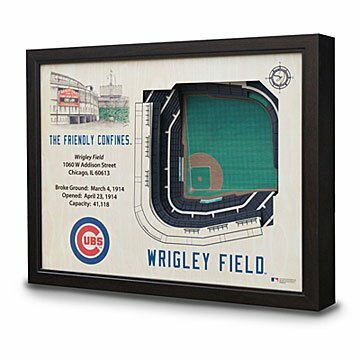 This three dimensional, laser cut wood wall art honors your favorite Chicago ballpark. Because your beloved Chicago ballpark won't fit in your living room, we offer these three-dimensional tributes to that storied Big League destination. They feature scale model reliefs of the ballpark created from multiple layers of laser-cut white birch plywood, accompanied by park facts and figures every die-hard fan should know, and hand-drawn, commemorative artwork by Kaitlyn Murphy. These beautifully crafted and detailed designs are officially licensed products, and make ideal gifts to let Windy City fans show their love of their favorite ball club and park. Handmade in Warsaw, Indiana. When I was a little girl, I used to sit and draw for hours and dream about becoming an artist one day. Today, I am living that dream as an illustrator and designer. I grew up in Warsaw, Indiana where I benefited from a great high school art program. I took as many art classes as I could, and went on to study art in college. I begin my creative process by researching figures and traditions associated with each sports team, and then I select three of these elements to incorporate into the piece. Ultimately, my goal is to connect a fan's passion to the stadiums that we create, so that they can feel the stadium even when they're not there. I bought the Citi Field version for my bf for Christmas and it arrived yesterday it perfect condition. Great quality showpiece for any baseball fan. Big enough to be a focal piece in any office, hangout room, or library. Best Valentine's Day gift for a Cub's fan! My fiancÃ© is a lifelong Cubs fan. This made the perfect Valentine's Day gift. He loves it! Christmas Present was a Hit! Very well made and the Cubs World Series version was a hit!!!! Ordered this for the Chicago Cubs 2016 season for a significant other who is a life-long team fan. The item was much larger than anticipated - a good thing for the price. Very high quality, love the attention to detail. I do wish the frame included glass over the piece of art because I can see issues with it getting dusty from hanging. I also think that charging extra $$ as compared against any other team, just because the Cubs won the World Series, seemed like gouging. But I didn't want to pass up the unique gift opportunity. My friend is a huge Red Sox fan and has been to Fenway many times. He loved it! We ordered this for a retirement gift. We were impressed with the workmanship. It is the perfect unique gift for a sports fan! My son is an avid Cubs fan and after they won the World Series he had to have this product. It is a wonderful focal point in his Cubs memorabilia room. Very unique. It is really a great picture of the stadium.